Knight & Hale had its best year yet at the 2017 ATA Trade Show in Indianapolis, Indiana. The Team rolled out our new product line for 2017, the most in Knight & Hale history, highlighted by the new Bone Collector Line products. Michael Waddell and the Bone Collector Crew stopped by the Knight & Hale booth on Wednesday at the show. Along with signing autographs and chatting with fans, Bone Collector’ Waddell, T-Bone Turner and Nick Mundt went live on Knight & Hale Facebook with our very own Harold Knight to talk about and demonstrate some of the new calls. 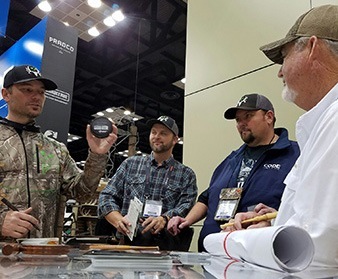 Multi-time world champion and expert call craftsman, Chris “Turkey Titan” Parrish was in the booth eager to answer the call of any customer, quite literally. Turkey hunters – in their never ending quest to find the next, best call – quickly gravitated towards the new Knight & Hale acrylic pot calls which boasts long-lasting durability and high-density for extreme volume. Those calls include the Storyteller, the Bone Collector inspired Canyon Cutter and the first of its kind high-end crystal acrylic call, the Moonshiner. The Razor’s Edge box call designed by Bone Collector’s Michael Waddell drove traffic to the booth with it’s high end laser cut aluminum side to ensure extreme rasp and unique cuts and yelps, and T-Bone’s Turkey Magnet push/pull call that magnetically attaches to your shotgun for easy, hands-free use created quite the buzz for turkey hunters across the show. For our new fall line, the Outlaw grunt call with a built in snort wheeze, built in collaboration with Bone Collector, was an instant hit. With an innovative beveled reed system, the Outlaw produces a deeper sound with more volume and consistency. Bone Collector inspired two other Knight & Hale deer calls, the Sneeze Wheeze and the Buckstop, both expected to change the game of deer calling. The Knight & Hale Team also created quite a buzz with the 2017 waterfowl, big game and predator calls, along with spring and fall accessories that are certain to make your hunts more successful.